Titanium is titanium based on the addition of other elements of the Alloy. Titanium has two kinds of homogeneous crystals: 882 ° C for the close-packed hexagonal structure α titanium, 882 ° C above the body-centered cubic β titanium. Alloying elements according to their influence on the phase transition temperature can be divided into three categories: ① stable α-phase, phase transition temperature increase elements α-stable elements, aluminum, carbon, oxygen and nitrogen. 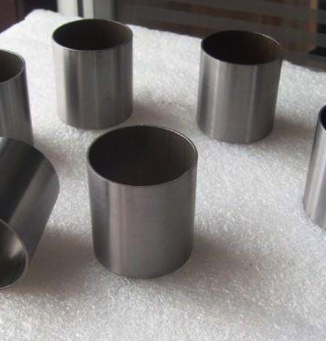 Among them, aluminum is the main alloying element of titanium alloy, which has obvious effect on improving the strength at room temperature and high temperature of the alloy, reducing the specific gravity and increasing the elastic modulus. ② stable β-phase, lower phase transition temperature of the element is β-stable element, and can be divided into two types of crystal and eutectoid. The former is molybdenum, Niobium, vanadium, etc . ; the latter is chromium, manganese, copper, iron, silicon and so on. ③ phase transition temperature is not a significant element of neutral elements, zirconium, tin and so on. Oxygen, nitrogen, carbon and hydrogen are the major impurities of titanium alloys. Oxygen and nitrogen in the α phase has a greater solubility, the titanium alloy has a significant strengthening effect, but the plasticity decreased. It is generally stipulated that the content of oxygen and nitrogen in titanium should be 0.15-0.2% and 0.04-0.05% respectively. Hydrogen solubility in the α phase is very small, titanium dissolved in excess of hydrogen will produce hydride, the alloy becomes brittle. Hydrogen content of titanium alloy is usually controlled below 0.015%. The dissolution of hydrogen in titanium is reversible and can be removed by vacuum annealing. Looking for ideal Light in Quality High in Strength Manufacturer & supplier ? We have a wide selection at great prices to help you get creative. All the Ferro Niobium Cored Wire are quality guaranteed. We are China Origin Factory of Widely Used in Heat Exchange Equipment. If you have any question, please feel free to contact us.